Babs has been over in East Jordan taking pictures. She pulled into a parking lot overlooking the braided flats of the Jordan River where it empties into the South Arm of Lake Charlevoix, and captured sunshine on ice. Beautiful, she writes, but still very cold. That water is all frozen. I fell in love with the Jordan River the first time I followed it along the Jordan River Pathway – and that was an accident. It was a long time ago, and I was, um, misplaced. It took me the better part of a magical afternoon to achieve . . . placement, and my heart has been tethered here ever since. Fast forward a few years and I had returned to northern Michigan for good. 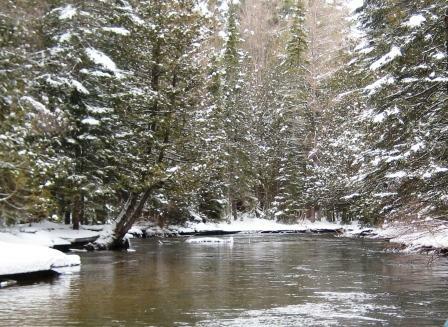 I explored the river on hikes and in a kayak – and even on a rubber raft in the winter. I watched bald eagles and ospreys hunting over the very spot in today’s photo. I listened to people who knew a great deal more than I ever will about the ecology of rivers. Dr. John Richter, president of Friends of the Jordan and a veterinarian, gave me the confidence to adopt Miss Sadie. The late and dearly missed naturalist Bud Jones taught me to recognize beech trees and to appreciate their value to bears. I owe these people. I repay them by telling you about the river. The first photo is beautiful, the second is just magical. Daugherty Johnson, snow sculptor, saw a bear traveling at speed across the cornfields up on Farrell Road. Kurt Koerber, who was mowing the grass at Lakeview Cemetery when I was over there paying my respects to my beloved Civil War veterans, warned me that quite a few bears travel through the swamp out along the Flat Road. Jim Gainey, who occasionally fills in at the Eastport Market in the summer, had a bear at the bird feeder in his yard along North East Torch Lake Drive (right near Nora Metz) back in 2009. I even posted a photo of Jim’s bear: Some days you get the bear, some days . . .
We definitely have bears Around Here. Also coyotes and foxes and bobcats and suicidal deer. With any luck, we might one day have wolves. They would help to minimize the population of suicidal deer. The pictures are wonderful, the thought of neighbourhood bears, less so. Shy bears are my kind of bears if there have to be bears. Classic views from the North Country. Last I heard Lake Monona here was 2 feet thick. Our lakes are still pretty well frozen, too. 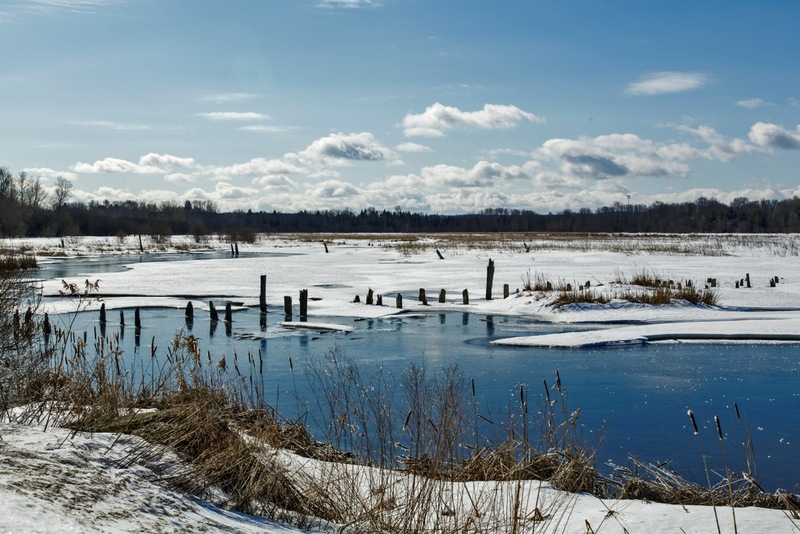 That first image is of the very slow-moving Jordan River estuary in East Jordan, but the bit that looks like still blue water is actually shiny clear ice reflecting the sky and clouds. If it weren’t so darned cold a person could get lost in contemplation. That second photo is wonderful, but I’m curious about the first. When I enlarged it, it looked at first as though there was snow or bits of floating ice, but then I decided it might be cattail fluff blowing around. I learned recently — as in the past year, perhaps — that black bears are returning to East Texas. That makes me happy, although I’m far more likely to run into a bobcat, coyote, javelina or deer. Or an alligator. Their mating season is nearly here, and they do tend to roam a bit. Cue a chorus of “Lookin’ for love in all the wrong places…” — like the freeways and marinas. The second was from my archive–a winter rafting trip on the Jordan, just to show you what the wilder part of it looks like. That first one is, of course, Babs at work. I believe the fluffy white bits are all snow on the ice but we’ll have to see what Babs says. I’ll get her to take a look. You know, I might could stand to be colder than a wedge for a while if what went with it is the kind of views pictured above. One of the things I’m looking forward to after I’ve moved is having an easily accessible place to walk. Hopefully, it will get me off my well-upholstered duff and outside walking. Keeping dogs will get a person out and walking even at peril of life and limb . . . but I agree it is much, much nicer to do the walking in beautiful and accessible places! Something about snow and open water…even if it’s late in the season and a person might be ready for no snow any time now. The river looks a bit like a creek near me that is now up on my header. Pretty. I hope it is spring soon so we can go for a walk over there. Oh yes we are ready for No Snow now. As if. I am going to get to broadband today and look at other people’s pictures and stories. See you later! Looking forward to your (late?) spring photos of this place when the snow is all gone! I was looking at some from years past and thinking how lovely it all is in the spring. I remember spring.